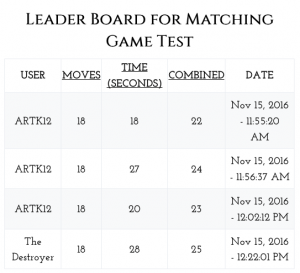 The ARTK12 matching game is fun. I even play it sometimes (I won’t tell you my scores). But after a couple of times…well, your students have seen the art pieces, they’ve bettered their scores (maybe) and that’s all folks. Kind of loses its appeal. So how about a little friendly competition? What if your students could see their past scores? What if they could both compete against themselves and the millions of others playing the games? Okay….thousands…..okay, hundreds? Okay, maybe dozens, but hey, that could change. 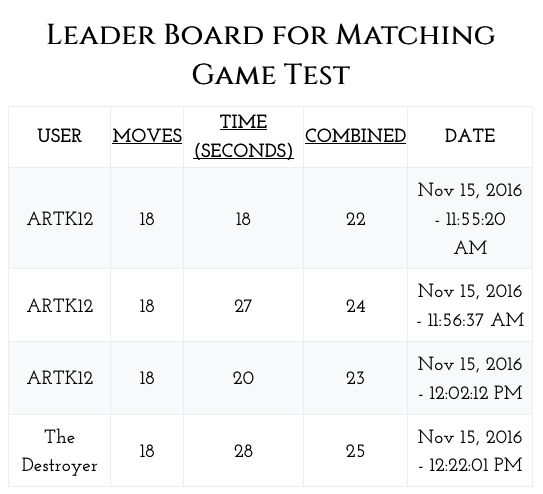 Leaderboard for Each Matching Game. This is for anyone who has played the game. Maybe I’ll show the top 100…something like that. It will show best times, least moves and best combined score. Your students will be able to see their individual scores for each game….maybe their top ten for each game. 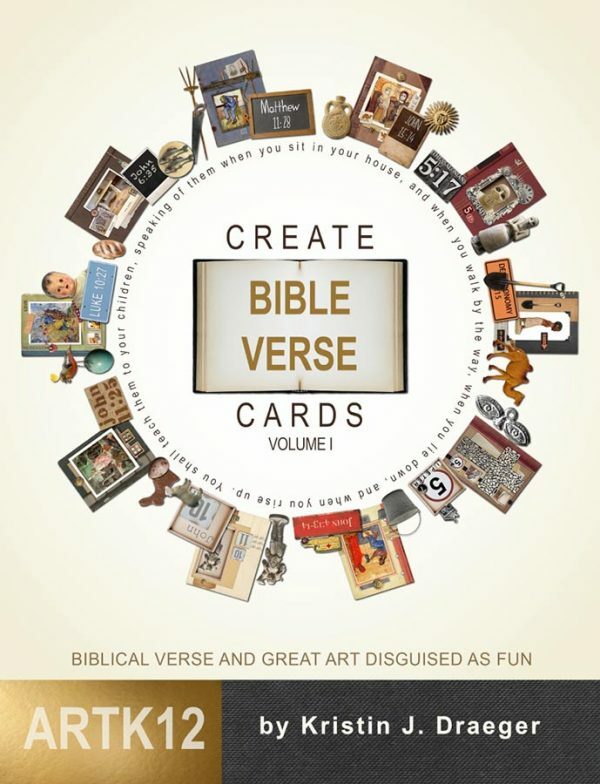 I’m also thinking of creating a 2nd, related matching game for each current game. This matching game would test the student’s knowledge of the information panel that pops up after a match. So in the 2nd game students might be matching a painting with its artist or a painting with its title. These games would be more difficult. The goal is to get students looking closely at great art, learning some basic facts about it AND having fun at the same time. If you have comments or suggestions, please do not hesitate to let me know. 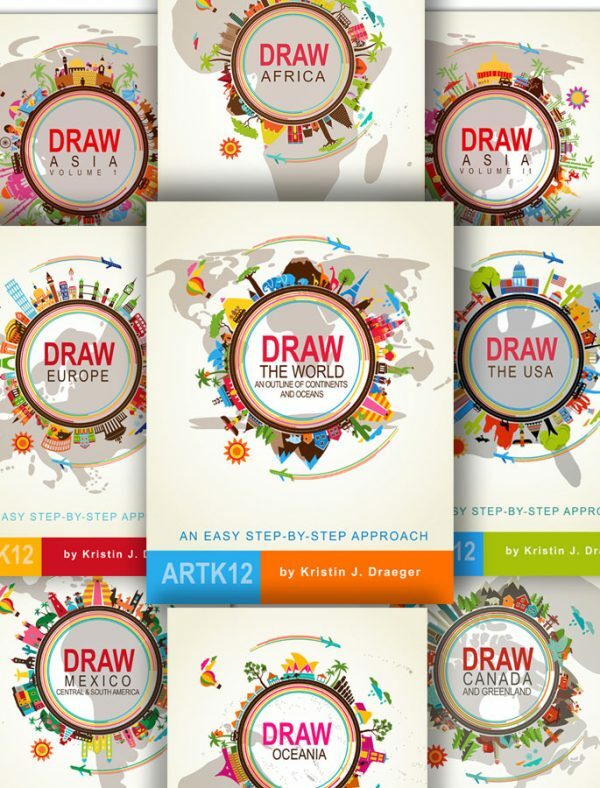 Leave a comment below or email me at info@artk12.com. 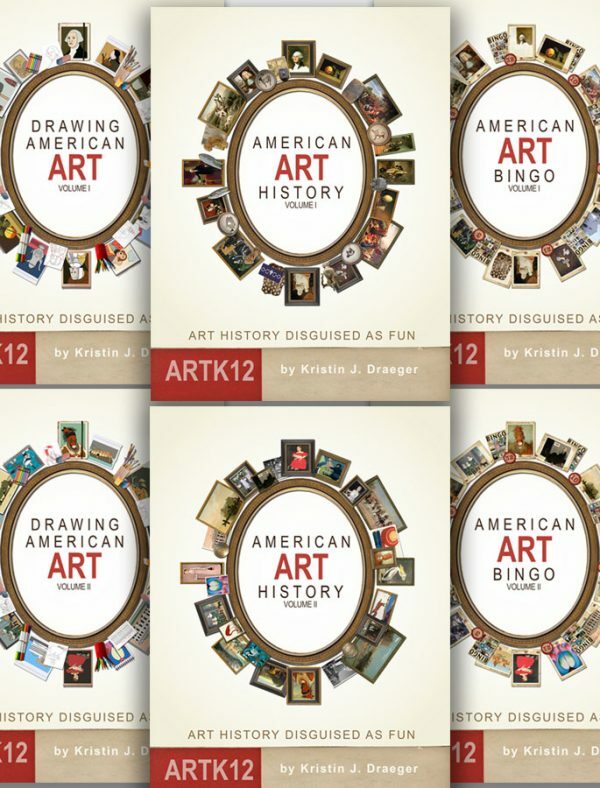 View Work on Draw the World Has Started »« View American Art Bingo is Here!